Despite efforts by the Trump administration to prop up ZTE Corp. dropped 27 percent after American lawmakers passed a bill to restore severe penalties on China’s second-largest telecom gear-maker, potentially up-ending a deal struck with President Donald Trump to allow it to get back in business. The company has lost $7.2 billion of market capitalization in the past week, as its Hong Kong shares slid to their lowest in a year Tuesday and the Shenzhen stock plunged the 10-percent daily limit for the fourth straight day. ZTE has struggled to end a seven-year ban on American technology purchases that has crippled its business. The selloff ensued after the U.S. Senate passed legislation that would restore penalties on the company, complicatingTrump’s efforts to ease sanctions on ZTE after it pays a record fine and reshuffles management. A settlement on the issue is also deemed pivotal to tense U.S.-Chinese negotiations over trade. But the wrangling over the company produced a rare instance of Republicans allying with Democrats to defy Trump. Reinstating a ban would cut off ZTE’s access to the chips and components it needs to build smartphones and networking equipment -- essentially a death sentence. The bipartisan Senate measure, part of a defense bill, passed 85-10 and came two days before Trump was to host Republican members of Congress to discuss ways to allow ZTE to get back into business. Trump’s agreement with ZTE was struck after the U.S. in April blocked its access to U.S. suppliers, saying it had broken a sanctions settlement and then lied about it. That prompted the company to declare its operations were grinding to a halt just weeks later. A settlement was deemed a key Chinese demand as the world’s two largest economies try to avoid a trade war and negotiate the denuclearization of North Korea. After a personal plea from Chinese President Xi Jinping, Trump last month instructed the Commerce Department to find a solution to save ZTE. 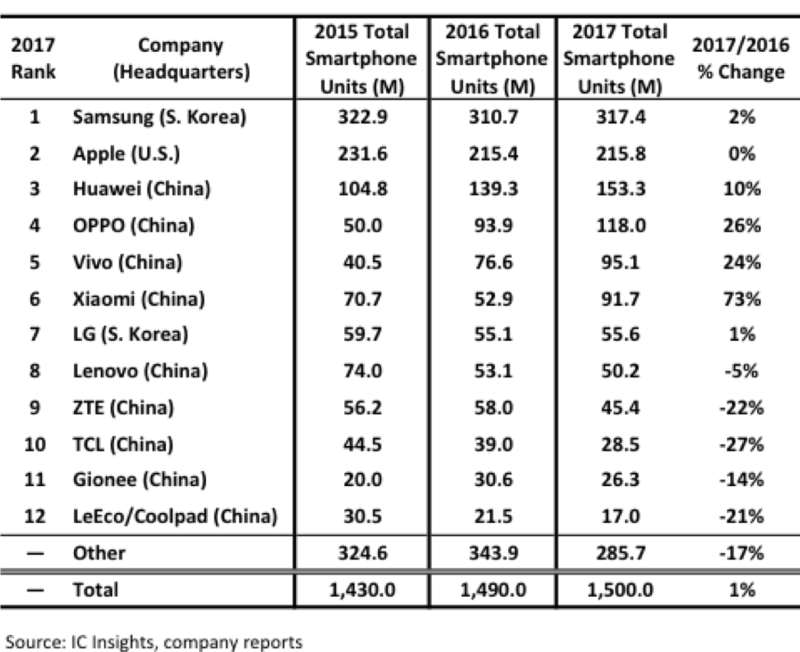 According to IC Insights ZTE was the 9thlargest supplier of smartphones in 2017 at 45.4m down 27% Y/Y and 12.6m units.